Though we’d all rather everything works as intended with our Macs, occasionally something goes really haywire and OS X becomes either royally messed up or unusable. 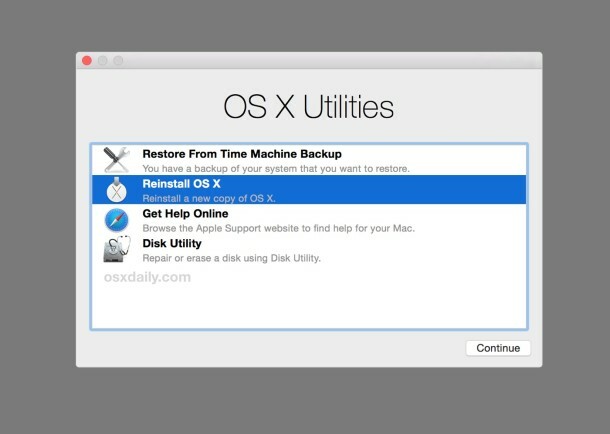 In these circumstances, sometimes the only solution to get things working again is to reinstall OS X system software (or, if you have a recent safe backup made, restoring from Time Machine is often valid as well). 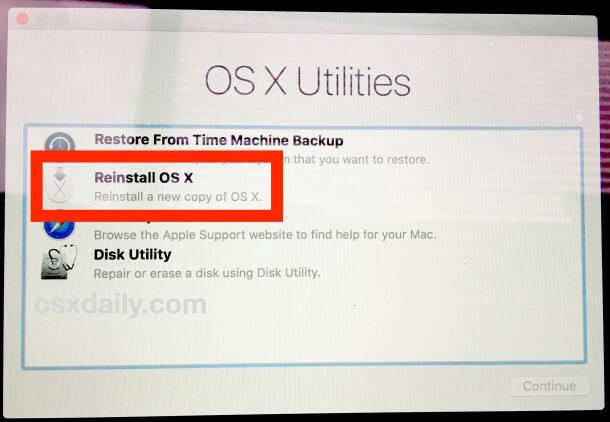 We’ll cover how to reinstall Mac OS X system software only with Recovery Mode, this reinstalls the most recently available version of OS X that is (or was) actively running on the Mac. If performed correctly as described, applications and user data will be preserved and not be modified at all, since this approach only reinstalls the operating system and system files. 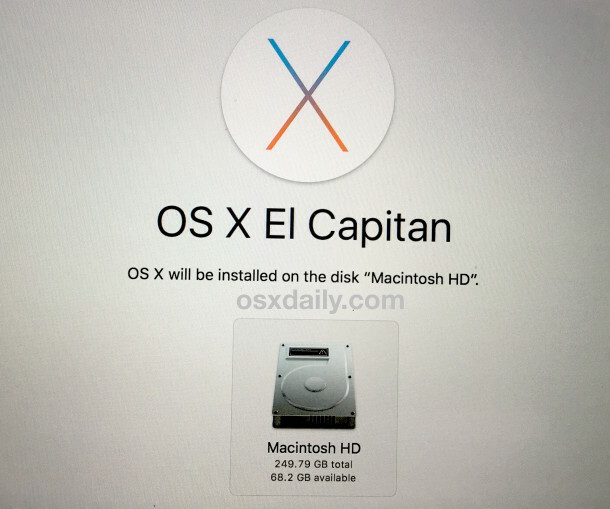 Update: this article pertains specifically to reinstalling OS X on Macs, including El Capitan, Yosemite, and Mavericks. Newer MacOS releases also support the ability to re-install only macOS while leaving user files alone, however. If interested you can read how for macOS Mojave and High Sierra and Sierra. The premise is mostly the same; booting into Recovery mode to reinstall the system software. Note how this is different from re-installing OS X with Internet Recovery, which loads entirely from the internet, and then reinstalls the original version of OS X which came with the Mac instead, that method is sometimes necessary if the standard recovery option doesn’t load, or if you want to reinstall the original version of OS X for the computer in question. This is also completely different from a clean install of OS X, which is performed by erasing a Mac drive and then starting fresh with a new clean installation of the Mac OS X system software. Before getting started, you’ll want to be sure you have a fast and stable internet connection available for the Mac, this is because the installer files for OS X download from Apple. Trying to reinstall OS X through a flakey or slow internet connection is not recommended, unless you were to use a bootable install drive or something similar where downloading reinstallation components is not necessary. You’ll also want to set aside at least an hour or two to complete this process, the exact time it takes depends on the speed of the internet connection in use, and the speed of the Mac. It’s a good idea to back up the Mac with Time Machine before beginning this process. Even though this method aims to only reinstall OS X system software on the Mac, things could still go wrong and it’s always better to lean on the side of caution and make file backups beforehand. When reinstallation completes, the Mac will reboot itself again as normal, and you’ll be presented again with the typical login screen associated with OS X – log in to your user account as usual and everything should be in order, complete with a new install of OS X system software on the computer. * If you get an error message about being unable to reinstall OS X because the Mac isn’t connected to the internet, you need to join a wi-fi network or connect via ethernet. The installer must download from Apple for this to work. This works to reinstall OS X exactly as described, I had to run through this process recently when I encountered probably the worst and most bizarre bugs I’ve ever seen in OS X, where “Macintosh HD” became stuck in the Trash can and actually started deleting system level files when emptied, which as you can imagine leads to all sorts of problems with the operating system missing critical components. While it’s unlikely you’ll ever encounter such a bug yourself, it is possible for users to mess up their system folders if they have disabled SIP or are using root, if the startup Mac OS volume has been erased or misplaced, if a prohibitory symbol is encountered at startup (sometimes a folder with an X through it, or a folder with a blinking question mark), or if the OS X installation is erroneous or royally messed up. 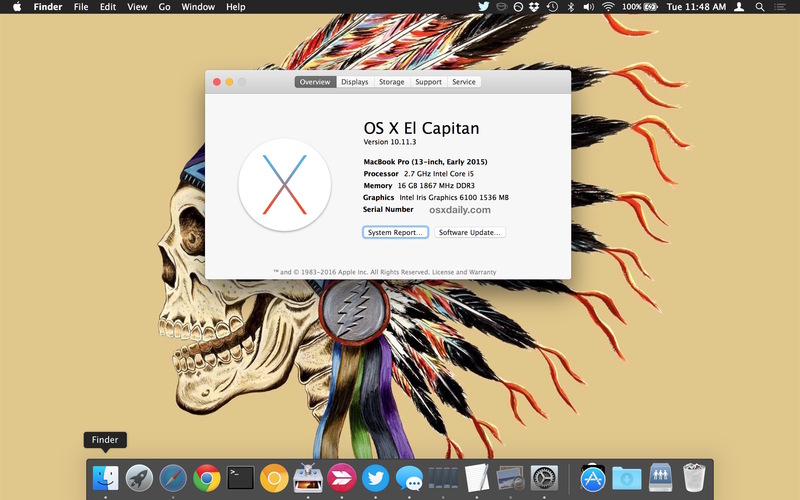 Remember, this method is not the same as a clean install, and it only reinstalls the version of OS X that is currently running on the Mac (shown here with El Capitan), whereas Internet Recovery will reinstall the version of OS X that shipped with the Mac (in this case it would have been Yosemite) instead. Obviously the versions of OS X will vary depending on what came with the Mac, and what the Mac is currently running. While this article describes this system reinstall process with OS X versions specifically, you can also read how to re-install only macOS Mojave while leaving user files alone and for re-installing MacOS High Sierra and Sierra in the same way too. The premise is mostly the same; booting into Recovery mode to reinstall the system software. Regardless of what Mac or Mac OS version you are trying this with, always backup the computer beforehand. This article got me thinking, I have a late 2014 iMac 5k with 1 TB Fusion Drive. If I need to do a reinstall – or even a fresh from scratch reinstall – does the installer know what goes on the SSD part of the drive? Or dod I select what would be install on that section? Fusion Drives are just a spinning drive with a small SSD portion for caching what is currently accessed, they usually aren’t partitioned in a user-facing manner. Thanks Pepe for the info. Figured a good time to ask, I don’t have any issue – but better to know before hand. No I haven’t touched the drive since bought. I wasn’t sure if the OS was installed on the SSD part and the installer figures it all out on reinstall. Darn iMac Boots faster than my iPhone 6 just about. Actually, the Fusion drive from Apple does not have an embedded SSD portion for caching. The Seagate SSHD’s have this feature integrated in to the hardware of the HHD. The Apple Fusion drive is one Standard 1TB HDD, and a separated 128GB SSD gumstick (that is mounted to the backside of the Logic board). The installer should see the Fusion drive as one logical partition. The OS would be installed on the SSD, User’s Home folder will reside on the HDD. Any other data that is accessed often will then be moved to the SSD for faster access. No, this reinstall method requires Recovery partition and it reinstalls OS X on the target drive. But Internet Recovery can boot and reinstall without the recovery partition, but then you are left having to update OS X yourself to the newest version. For a new drive, I would perform a clean install with a USB stick of the latest release. Or, by far the best approach for drive replacement, is to clone it over with CarbonCopyCloner or SuperDuper, both are very easy. Also, if you plan on reinstalling a computer to give away, there are some security priorities to keep in mind. Another big part of the reinstall process is that it asks for your Apple ID, whereas the internet recovery will not. I could not get an answer from anyone at Apple what security flaws this has on someone reinstalling using recovery vs reinstalling from internet recovery. Apple says to use internet recovery when in doubt and let end user upgrade (fair enough). More importantly, wipe the drive with ones and zeroes. Don’t just do a simple format. It’s good security practice to require a login on boot, wake, and reboot, so you don’t allow unauthorized users access to the Mac. You might have enabled File Vault (which required your password for decrypting the drive upon login). You can check in Security & Privacy. You might have also allowed your login to be controlled by your Apple ID. This could be the reason for the password change. Go to Users & Groups in System Preferences, then click Change Password for your account and see what it says that it is using for your password. Hmmmm, it’s worked fine for me since 10.2. Sounds like you don’t maintain a clean OS. Ive never had to reinstall any of my personal computers OS’s in the past. I have had to reinstall OS’s for users that are not diligent with the third party apps that are installed. But hey, nobodies OS is perfect. When I worked for a school district managing 2400 Dell’s, we were constantly reimaging machines due to OS issues ranging from Widows XP, Vista, and Win 7. We had far less OS issues with the Mac’s. I had to revert to Yosemite from El Crapitan because my older MBA refused to act right. Apple told me to revert, but I didn’t have a disc or could I get it to load from the App Store. I just so happened to have a Time Machine of my other MBA and I cloned it from that. I still have not upgraded and am scared to death to do it. I have three MBA’s. can u plez tell me how can i go back to yosemite ? Good tip for the next few months! The fact I can get it right now and I’m still not over the next OS X realease tell you how much you love it! I’m trying to do this but I get stuck after unlocking. It asks for my Apple ID to download from App Store. After that it says “This Apple ID has not yet been uset with the App Store” with Cancel ja Review options. After Review nothing happens. Help me? Strange, perhaps log into the Mac as usual (before reinstalling) and authenticate in the Mac App Store with the Apple ID you wish to use, then try to use this reinstallation method with that logged in / authenticated Apple ID. Be sure the Mac is connected to the internet as well, with working access. I am having this issue also with our enterprise installs, can’t install from a LOCAL RECOVERY PARTITION without remove approval from the app store. Apple has become microsoft, what a retarded company now. – Firstly, thanks in advance for your valuable time. – I have a thorny issue with the Apple Store, I try to download a full installation but unfortunately I cannot. When I press the button continue after I click “Download”, shows me that something tries to load but never starts any process. – Could you tell me please how I could download the whole operating system in order to create a disk because I need to format my drive? Hi there, I wonder if you can help? I have some old Tech Tool Pro files stuck in my trash folder. I’ve tried everything to get rid of these files (sudo commands, trash It and all sorts) No luck. 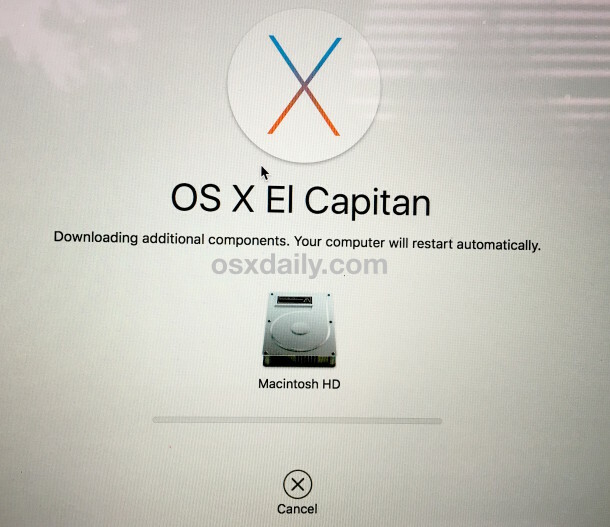 My last resort (as these trash files have transferred to my new machine) will be to reinstall the El Capitan. Do you think this will solve my problem? Yesterday I did install OS X Sierra then I found out that some of adobe programs have a Gard time to function well and even some of them does not work like AE. How can I go back to my old last OS X Mountain Lion, and to keep everything as it use to be. what’s the deference between downgrade and reinstalling? My MacBook is screwing up. My HD is working fine, no faults or in need of repair, but for some reason the machine boots up with the Apple logo & loading bar takes its time to load up. Then it stops when it’s full, but won’t take me to the log in page even after several hours. What the f is that all about???????? Do I need to do a reinstall or what? Help!! So I had a problem with my Macbook and did the same as above however after installing the OS from the internet upon restarting it automatically starts up in recovery mode and presents me with the utilities menu rather than the usual user interface. Any ideas? It’s a mid 2009 Macbook Pro 15″ running El Capitan I believe. Hi i came across this site while searching on how to reset my 2013 MacBook Pro ready fro sale as i have transferred everything to a new MacBook 2017. After watching youtube on how to erase the data from it hard drive from disk utility. My ssd hard drive is greyed out as it has file vault turned on – I’m not a computer tech and just looking for the simplest easiest way to reset the laptop. Not sure if just reinstalling the OS writes over my user account and data? or if i have to erase that first. Really would appreciate any advice. Format the hard drive and then reinstall Mac OS X if you want to erase the data and then reinstall. Reinstalling Mac OS does not format the drive unless you want to. I was preparing to sell my macbook air so i erased everything from Macintosh HD and tried to reinstall OS X el capitan but i kept getting the notification “external components needed for download not available” so i did an internet recovery and tried to reinstall again. It seemed to work but loads up to about a quarter and stops. I tried to restart a couple of times and got the notification “external components needed for download not available” again a couple of times. What do i do now.